This is a help page for contributors or users. This page contains no legal help information. See other Clicklaw Wikibooks Guides. This style guide for Clicklaw Wikibooks aims to help contributors produce Wikibooks with consistent and clear language, layout, and formatting. This guide is to be used in conjunction with the Clicklaw Wikibooks Contributor Guide, which provides guidance on the technical aspects of editing and updating content. The title of a page should be in plain language (as a description of the topic or, for Legal Help for British Columbians, a question), concise, and consistent with the titles of related pages. Each page title on Clicklaw Wikibooks has to be unique, so make your page title as specific as possible. For example, use "Making Changes in Child Support" rather than "Making Changes". Use title case in page titles; that is, the first letters of all words should be capitalized except for articles (the, a, an), prepositions (in, of, to, from, with, etc. ), and conjunctions (and, but, for, or and nor). Use sentence case for section headings — that is, the initial letter of a title is capitalized; otherwise, capital letters are used only where they would be used in a normal sentence. Headings should not normally contain links, especially where only part of a heading is linked. Section and subsection headings should preferably be unique within a page; otherwise section links may lead to the wrong place. In general terms, resist using capital letters, as they hinder the reader when overused. Do not use capital letters for legal terms — e.g., "a retainer agreement is a contract between a lawyer and you"; "a will appoints an executor". Do not use capital letters for party names — e.g., "after the claimant files a claim, the respondent has 14 days to reply". Use capital letters for the names of prescribed court forms — e.g., "the claimant must file a Notice of Family Claim" — but do not use capital letters for general legal forms — e.g., "a power of attorney enables you to appoint someone to look after your financial affairs", or "a parenting coordinator agreement sets out in some detail what the parenting coordinator will do". Do not use capital letters for emphasis; where wording alone cannot provide the emphasis, use italics. Titles of books and other print works are given in title case — that is, the first letters of all words should be capitalized except for articles (the, a, an), prepositions (in, of, to, from, with, etc. ), and conjunctions (and, but, for, or and nor). Months, days of the week, and holidays start with a capital letter — e.g., June, Monday, Christmas. Seasons are in lower case — e.g., last summer, next fall. Do not capitalize directions such as "north", nor their related forms. Capitalize names of regions if they have attained proper-name status, including informal conventional names — e.g., "Lower Mainland". Do not capitalize descriptive names for regions that have not attained the status of proper names, such as "northern British Columbia". Names of particular institutions are proper nouns and require capitals, but generic words for institutions (e.g., "university", "college", "hospital", "high school") do not. Italics may be used sparingly to emphasize words in sentences (whereas bold is normally not used for this purpose). Generally, the more highlighting in a page, the less its effectiveness. Use italics to bring attention or distinction to a term — e.g., "Whether a party has the right to bring a dispute under a particular act and before a particular court is a question of that party's standing, whereas the ability for a court to hear particular disputes or questions involving particular types of parties is a question of jurisdiction." or "The term ex parte means without notice." Do not use quotations for emphasis. Use bulleted lists to break up a list of items. Use numbered lists if the list is a series of steps. need help or supervision because of the disability. Family Law in BC, for forms, self-help materials and other legal information about family legal issues. Family Justice Centres, to make an appointment with a counsellor to discuss parenting arrangements, contact or support. Family Duty Counsel (Provincial or Supreme), for some assistance on the day you have to appear in court. Common Experience Payment: A CEP is payable to all former students of Residential Schools. Independent Assessment Process: Under this process, a victim of abuse at a Residential School may apply for additional compensation. Use numbered lists if the list is a series of steps. Use double quotation marks; use single marks for quotes within a quote. Periods and commas go inside quotation marks, but semicolons and colons go outside. Do not use quotations for emphasis. Use italics. See Emphasis. Do not use quotations when clarifying the acronym to be used for a long term. Use parenthesis only. See Acronyms. the fact sheet "Dealing with a Problem Roommate" and the pamphlet "Tenant Info for Renters in British Columbia"
For publication titles, use title case; that is, the first letters of all words should be capitalized except for articles (the, a, an), prepositions (in, of, to, from, with, etc. ), and conjunctions (and, but, for, or and nor). Think twice about adding paragraphs from reasons for judgment. Pause before pasting in dense legislative text. It may be more helpful to spare the legalese if your readers are still seeking to understand basic legal principles. Cite and link the original law or case on CanLii for deeper study, but consider if you can convey the pith and substance of the law, without the need to regurgitate its chapter and verse. This said, in some cases it's critical to show readers the exact, verbatim wording from a piece of legislation, court decision, or other source. Section 7 of the Guidelines says the court is required to consider "the necessity and reasonableness of the expense in relation to the means of the spouses and those of the child." In Hanson v. Hanson, 1999 CanLII 6307 the Supreme Court of Canada cautioned that the courts cannot sanction "the refusal of a parent to take reasonable steps to support his or her children simply because the parent cannot obtain interesting or highly paid employment." For longer excerpts, use a block format. Clicklaw Wikibooks has two methods for block formatting depending on the type of source. Clicklaw Wikibooks uses blockquote tags <blockquote>...</blockquote> (including multiple indentation levels where applicable), and a monospace font () if the excerpt is taken from an act, regulation, contractual agreement or court order (as distinct from reasons for judgment). Doing this distinguishes the codified language and hierarchical structure of these sources compared to the more narrative and natural language flow of other types of content. (h) the spouse derives a significant portion of income from dividends, capital gains or other sources that are taxed at a lower rate than employment or business income or that are exempt from tax. Note that subsections (a-h) have additional indentation. Longer direct quotations of text written in natural language (like court judgments) are also block formatted, but maintain the default typeface. The block formatted indented excerpt is enclosed in quotations. If the excerpt is longer than one paragraph each paragraph begins with an open quote, but only the final paragraph ends with a close quote.
" The framework of s. 9 requires a two‑part determination: first, establishing that the 40 percent threshold has been met; and second, where it has been met, determining the appropriate amount of support.
" With respect to the second part of the determination [...] courts across the country have struggled to develop an interpretation of s. 9 that is consistent with the Guidelines’ objectives. While the approaches vary widely, they can be divided in two categories. One approach, similar to the approach used by the motions judge, can be described as the “formulaic approach”. The other approach, which may be described as the “discretionary approach”, eschews the use of formulae." Make links only where they are relevant and helpful in the context; excessive use of hyperlinks can be distracting, and may slow the reader down. Minimize using external links in the main body of a page; include only external links that are to essential resources or information. For other external links, look to include those in an external links section at the end, pointing to further information outside Clicklaw Wikibooks. In general, write whole numbers one through nine as words, and write all other numbers as numerals: one to five; 21 to 30. For currency, don't use numbers after the decimal point: $25. In general, use a comma to delimit numbers with four or more digits to the left of the decimal point: 1,050. Write 3% or three percent but not three % or 3 % with a space. Write telephone numbers with dashes: 1-866-565-4526. Ordinary references to specific dates in a header or body paragraph should list the day, month, year, in that order: 10 February 2013. In the vast majority of circumstances, write out the full name of the month. If the date reference is within a table, chart or graphic or ancillary annotation where condensed formatting is desired, the three letter abbreviation for months is acceptable: 10 Feb 2013. Use an em dash when you want to indicate added emphasis, a break in a sentence, or an abrupt change of thought. For example, "In matters of importance, sincerity — not style — is the vital thing." To form an em dash on most PCs, hold down the ALT key while typing 0151. On a Mac, hold down the ALT key and SHIFT key while typing the dash (-). The number of spaces following the terminal punctuation of a sentence in the wiki markup makes no difference, as the MediaWiki software condenses any number of spaces to just one when rendering the page. That said, modern practice is evolving towards just one space following the terminal punctuation of a sentence. Think about your reader and question what they know or don't know. Think about questions your readers will have on the topic, and organize your thoughts accordingly. Summarize main points using headers. Organize steps or similar information with lists. Write brief sentences and keep paragraphs short. Use common phrases and words. Avoid unnecessary descriptive adverbs and words. Write in the active voice and keep verb and subject close together. Ask another reader to evaluate your writing. 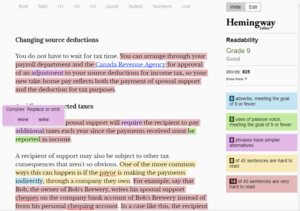 Hemingway App is a free online tool that analyzes your writing's readability and identifies possible problems. It can suggest improvements and help with plain language. The Hemingway App shows you a graded score (e.g. Grade 9), and highlights what's hard to read, what words could be simpler, etc. Just paste in your writing the and Hemingway App instantly provides suggestions and tips for improving readability. You can even edit your writing right there and then to see if you can improve it and bring the reading level down. A grade 9 reading level is ideal. Use that (not which) to introduce a restrictive relative clause (a clause that is essential to the grammar of the sentence). court (as in "go to court"), but "Small Claims Court"
This page was last edited on 8 March 2019, at 12:22.